From what I always felt the ultra was the first of the Supernova series to start getting cheaper components. It's still a great machine but there's nothing particularly "ultra" about it unless you get the free arm which are rare. The stitch quality and piercing power is similar to all the other Supernova machines. Two things that I have issue with. 1st is the motor, it's hard to get to and adjust. I much prefer the open motor design of other vintage machines. I can't tell you how often I want to adjust the motor when sewing heavy materials. Sometimes I like to used a cogged belt. 2. Punching power on these machines is reduced by all the machinery the power must pass through between the motor and the needle. You always want the most direct path if you want to keep as much power as possible at the needle. As far as free arm vintage (which is a difficult find) you could look into a Pfaff 360 series which I find to be a much stronger machine than the Necchi however the embroidery stitches are not all that fancy compared to the Supernova. Thanks for taking the time to do a great blog. 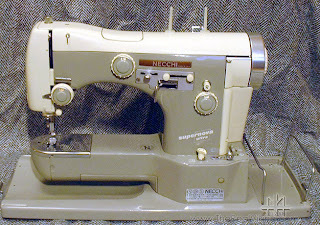 I have to say your blog was the only place I could find any sort of information on a Dressmaker S3000. I'm new to sewing. I currently have zero machines. In all my research I have fallen in love with the machines from the 50's and 60's and I don't even have one yet. The love of my life would be a Pink Necchi Supernova. But until I find her I'm looking at getting a Kenmore Convertible 1980 #158.19800. This would be my first, a learning machine for me. It comes with all the original attachments including the cams and embroidery attachments. It comes in a very nice desk. They are asking $100 but are willing to go down to $80. The motor sounds lovely but the the feed dogs only go back and forth and not up and down. Therefore the fabric won't move. Is it worth the price of $80 because I might need to get it serviced if I can't figure out why that's happening? I did read your post: Vintage Sewing Machine Addiction - A Survivors Guide. I'm learning a lot about what to look for in a good machine but I'm still unsure about what's a good price. I would appreciate any advise on this for a Vintage Newbie. This Kenmore Convertible is a little iffy... This was produced after the heyday of Japanese manufacturing. Likely the feed dogs on the machine just weren't engaged in the one you're looking at. You don't want to get a vintage machine serviced unless it's really a nice machine. They will charge you $80 to dust it out and squirt some oil on it which is more than the machine is worth. Set a budget of $25 for these store brand vintage machines and $100 for better brands. Old sewing machines are a dime a dozen, don't overpay! My friend Dennis in Alabama picked up a Featherweight at a garage sale for pennies, I myself just picked up a Pfaff 1473 CD worth $750 for only $30! Try and avoid the cabinets, they're just boat anchors in your life and worth little to nothing. Harder to find yet more functional are machines that come with a carry case. Brian, I have a question about cabinets (or, about not using them). I have some very nice sturdy tables that I use for sewing. The problem I have with my old sewing machines is that they tend to vibrate a lot and "travel" on the table. Any advice on getting them so stay put? Thank you so much for answering my email! And so quickly too. You have one more loyal reader. If you are interested in an update, I will pass up on the Kenmore. However, I did pick up a Dressmaker s3000 for under $25. Thanks again! Your information on these machines is really useful, thank you, Brian! Although we don't see the same models here in Australia your knowledge and experience has helped me a great deal. I never thought I would use one of these machines (I have three lovely modern machines) but I have really grown to appreciate the quality of stitching from a good, old fashioned straight stitcher. I'm on the lookout for the right one at the moment and will refer to your knowledge base when I find one, so thank you again! Are you planning to sell your sewing machine this time? I find my vintage cabinet to be a godsend, not a boat anchor. I live in a small apartment. It's not only a beautiful piece of furniture, but it doubles as a desk. Nobody knows it's a sewing machine. I don't like clutter so when I'm done sewing, the machine folds away, and my living room is back to normal. I don't have much closet space to store machines either, so this cabinet is ideal. Modern tables and cabinets are ugly, in my opinion. I wouldn't give up my vintage cabinet for anything. i agree about most cabinets being boat anchors.. but I found a beautiful solid oak one where everything folds away and no one knows it's a sewing cabinet. I like that my machine is right at hand when i need it and I don't have to haul it out and find somehwhere to use it. Plus it stores all my sewing necessities.